Droom Comes True Campaign Extended! Droom’s shopping bonanza “droom Comes True” is in full swing! If you have not yet taken the advantage of the stupendous savings on automobiles, then do it right away. Drive your way to droom android app and pocket some descent savings. 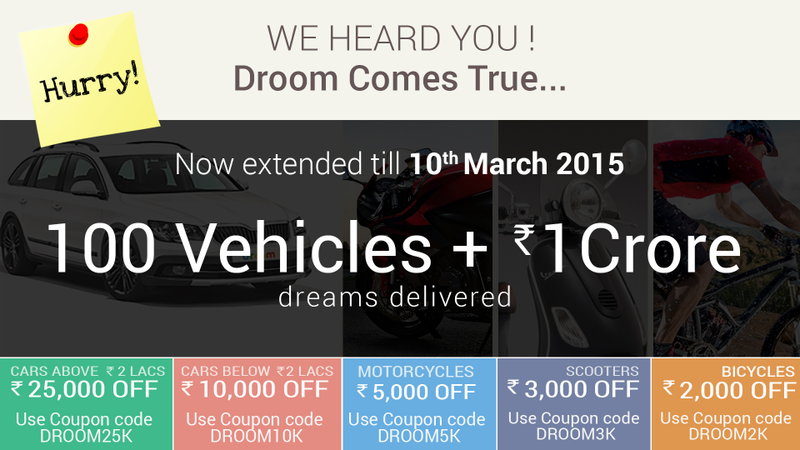 Droom Comes True campaign is now in the fifth gear with lot of people taking advantage of the discount coupons. And yes we heard your voice, on demand of our users; we are extending the savings till 03/10. It’s high time for buyers to buy their dream vehicle, as they will be able to save up to flat ₹25,000 till March 10. Shop new or used cars, motorcycles, scooters, and bicycle along with superb discounts. Registered users (sellers and buyers both) can take benefits from this offer. Make sure to use respective coupon code at time of purchase to get savings till March 10, 2015. On top of everything, we help you shop from a verified and a trusted seller. We provide peace of mind and security for money, as each transaction done using our platform is backed by Droom Buyer Protection. Droom.in is India’s first marketplace offering a transparent and a fully transactional platform for buyers and sellers. And to fascinate enthusiast bikers, we have introduced a new category for super bikes. From Harley Davidson Superlow to Kawasaki Ninja to KTM Duke and more get your dirty bike here. Hurry up! Shop now; offer valid for limited time only. Bid to Buy 2013 Bajaj Pulsar 150cc for ₹999!